During each of the three days of convocation, one graduate addressed his fellow students and convocation guests, sharing his thoughts about graduation and the journey that brought him there. On Thursday, June 11, the graduate address was given by Marcel Ducharme, of Calgary, Alberta, who received his Master of Distance Education degree. The Voice thanks Marcel for sharing the text of his address, which is printed below. Madam Chair, Mr. President, distinguished guests, members of the platform party, graduates, families and friends, ladies and gentlemen. 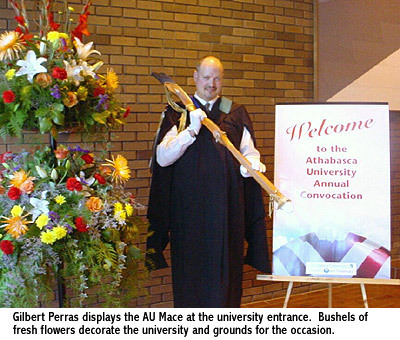 I am both privileged and honoured today to stand before you to deliver the Graduate Address for the Athabasca University 2009 Convocation. When Mr. D?Arcy tried to contact me a few weeks ago I was out of town, so he asked my wife to relay a message for me to phone him as soon as possible (ASAP) although he wouldn’t give her any details. So my wife sent me an email with the subject title of ASAP with a big exclamation mark. My immediate reaction upon seeing the email on my Blackberry was that something was wrong because it never fails, if something is going to go wrong it always happens when I’m away from home. 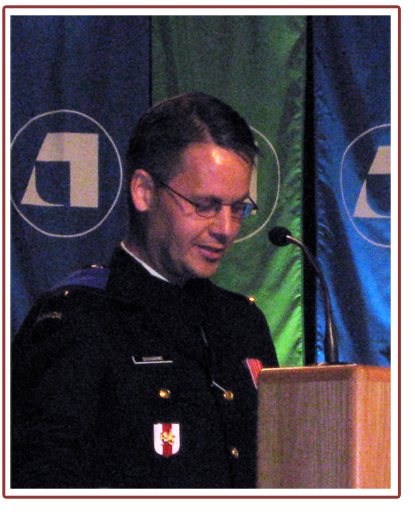 However, after reading the message my reaction turned to curiosity, and then after speaking with Mr. D?Arcy it was amazement and excitement to think that I would be giving the graduate address at the Athabasca convocation ceremonies. The excitement I felt was shared by much of my family, which was notable from my wife’s postings on Facebook and my mom’s desire to call everyone. In preparation for this address I spent a significant amount of time reflecting upon my educational journey at Athabasca. When thinking about the discourse I had with other students from across the globe over the last few years and my own personal experiences, there is no doubt that we’ve travelled a very challenging road in order to get to this milestone achievement today. This reminded me of a comment made by Dr. Eastman on one of my courses last year after hearing about my training for the Boston Marathon in a welcome forum; to paraphrase him he said ?a marathoner’s commitment to train is pretty impressive, although to complete a degree by distance education, you also need to be a kind of marathoner.? Our coming together today for convocation is an opportunity to reflect back on the significant commitment we made to embark and continue on with this marathon educational journey; it is also an opportunity to examine the life experiences we had on the road we’ve travelled for the last number of years and how they have impacted upon us, and lastly an opportunity to contemplate how we see our future unfolding as we come to the end of this particular road in our lives. For most of us I’m sure it does not seem all that long ago that we gathered the courage to apply for admission into Athabasca. After examining a number of university programs, there were three attributes that drew me to Athabasca. First was its dedication and excellent reputation for providing quality adult education; second, the flexibility of the programs would allow me to work at my own pace so I could balance my family, work, and community commitments with my studies; and third is Athabasca’s innovation and application of technology to make learning accessible, especially as I was required to travel due to my job. Each of us had our own unique and individual life circumstances when considering a university; in the end one or more of the mentioned attributes or Athabasca’s commitment to openness appealed to us in some way or we would not be sitting here today. At the onset of our programs of study, I suspect that many of us were wondering what we had gotten ourselves into with the volume of required readings and learning activities. For me there was also the challenge of transitioning to the distance learning delivery methods, which was apparent by my initial apprehension on uploading my postings to the online discussions, although I spent considerable time and effort in preparing them?after all, it was a permanent written record and open for debate over an extended period unlike my undergraduate days of fire and forget during traditional face-to-face discussions. Then there were our initial papers, which I well remember feeling some nervousness when preparing. Thankfully, we had the support and understanding of the faculty and our classmates to help navigate through these initial challenges. During our time at Athabasca many relationships developed with fellow classmates, which brings to mind numerous fond memories of the online dialogue and group project work we experienced together. I think a key to the growth in these relationships was the supportive, collaborative, and open environment that was encouraged by our professors and respected by our peers. Many of these relationships began through online social forum introductions in our courses and then matured during the follow-on forums where classmates helped us to challenge our assumptions, values, and perspectives. The demanding group project activities also provided an opportunity to work closely with our peers and to not only learn with them, but from them as well, as they freely shared with us their knowledge and diverse experiences. It was during these group projects that I found inspiration and comfort when hearing about the challenges others faced in balancing their studies with other commitments, some of which were similar to my own. I well remember one group project where four of us compared our learning anytime/anywhere stories in relation to our kids? extracurricular activities, which ranged from early morning hockey practices to evening soccer games, and lots of other activities in between. In balancing such hectic schedules I’m sure most of us improved upon our time management skills and ability to persevere under what likely seemed the never-ending stresses of life’s demands. 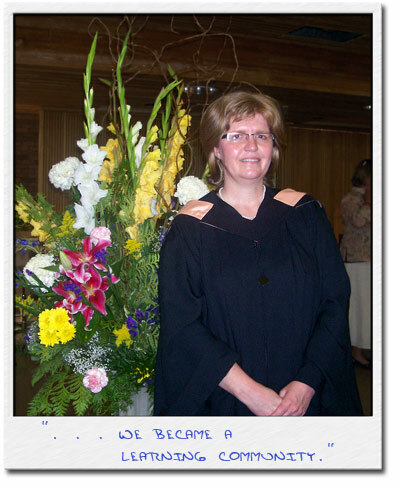 My reflection of the learning experiences at Athabasca University also brought to mind the role of the faculty and other staff on our educational journey. The faculty’s supportive guidance and gentle pushes?or potentially not so gentle?have been instrumental in helping us to achieve the success of getting here today. To the faculty, thank you for being that guide at our side and sharing in our learning experience. The importance of the support staff at Athabasca also needs to be recognized for their role in helping make this university the exceptional educational institution that it is. To name a few, there is the staff in each of our programs who attended to our many phone and email enquiries, the library staff who mailed out all our course materials and the many reference books in support of our studies, and the helpdesk staff who provided us with technical support to keep us up and running whenever and wherever we were studying. A warm and sincere thank you to all these Athabasca staff and those others not specifically mentioned. In looking back over the many learning experiences and challenges we’ve had while on our learning journey, much of this was shared with our family and friends. Their emotional support of listening to us talk about our latest readings and the challenges of our assignments, assuming additional family responsibilities so we could focus on our studies, and understanding the time demands of our studies were all key in helping us complete our programs. We should also recognize our family’s tolerance as our books, notes, and other study materials infiltrated our homes, along with their patience as we monopolized the computer night after night. For all this we are truly thankful to our family and friends, and recognize we could not have travelled this road without their support. To conclude, I would like to highlight that it has been through extensive hard work and determination we’ve reached our educational goals and come to the end of this particular road in our lives. It has truly been a marathon effort, but well worth it as we begin to see the many different roads now open to us. As we consider these various roads and move forward into another phase of our lives, be assured we are well prepared as we can draw upon what we’ve learned in our studies and the life experiences that have strengthened our character. I hope you all continue to challenge yourselves and use what you’ve learned to better your communities, our country, and in the words of Mahatma Gandhi ?be the change you want to see in the world.? 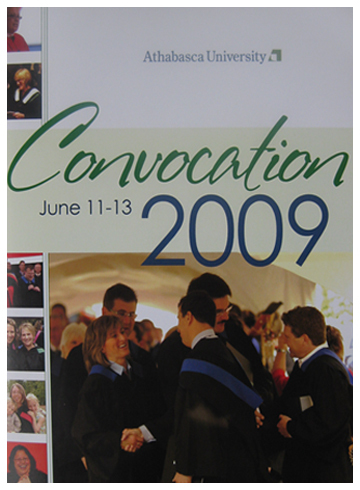 I would now ask that you join me in congratulating the Class of 2009!